This production of Sondheim's greatest achievement is performed up close and personal by dedicated professional Actors' Equity performers, an extraordinarily talented cast, led by Broadway veteran Douglas Ladnier as Sweeney Todd and the award winning Alison England as Ms. Lovett. The New York Times calls Douglas Ladnier, simply, "The Best" and Rex Reed raves in The New York Observer, "this guy's melting baritone could single-handedly revive the art of the ballad, the love song and the heart-breaker." Backstagemagazine boasts "Extraordinary . . . one of the best-timbered voices on the scene today . . . the stuff of greatness." Stage LA calls Alison England "supremely divalicious" and LA WEEKLY says she "secures the limelight, radiating a glittering comic menace with her manic stares and scintillating vocals." Mr. Ladnier was in the original Broadway production of Jekyll & Hyde and has appeared in more than 60 countries around the world where audiences and critics alike have been thrilled by his unique, mesmerizing baritone. Ms. England has performed at Lincoln Center, The Kennedy Center, Radio City Music Hall, The Dorothy Chandler Pavilion and with theater and opera companies all over the world and makes a lasting impression on everyone who hears her. This powerful duo is sure to provide an evening of top-notch, world-class entertainment supported by a stellar cast which includes *Matt Steele (Tobias), *Alxander Jon (Anthony), Devon Davidson (Johanna), *Kendra Munger (Beggar Women), *Chuck McCollum (Judge Turpin), *Craig McEldowney (The Beadle) and Mark Rohner (Pirelli). The Ensemble includes Antonio Ardolino, Michael D'Elia , Melinda Ehrlich, Marty Feldman , *Lena Gwendolyn Hill, Rachel Hirshee, Kelly Meyersfield, *Hector S. Quintana and *Anibal Silveyra. The creative Team includes: Director* Kristin Towers-Rowles, with Music Direction by Joe Lawrence, Assistant Director Stephanie Fredricks, Stage Manager Samantha Marie, Set Design by Erik Austin, Lighting Design by Samantha Marie and Costume Design Michael Mullen. This may be one of the final opportunities to enjoy professional actors performing at their peak-level simply for the love the of art, serving up Sondheim's brilliant score to the Los Angeles audience under the current AEA 99-seat plan, as the decision to keep or scrap the plan lands on April 21st. Come and visit your good friend Sweeney and see what all the fuss is about!!! 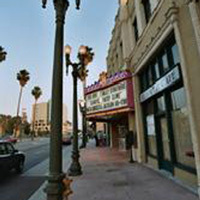 Sweeney Todd plays Friday, Saturday and Sunday evenings (8/8/7PM), April 10 - May 10 at the Monroe Forum Theater 5269 Lankershim Blvd., North Hollywood, CA 91601. For tickets call 818.508.4200 or 866.811.4111 or visit www.elportaltheater.com.